Peppers are extremely fun to grow since there are dizzying arrays of them to choose from; with a variety of colors and flavors from sweet to the hottest hot. Because of this variety, it is sometimes difficult to know when to begin harvesting the peppers. Peppers have been cultivated in Central and South America, Mexico and the West Indies since ancient times, but it was early explorers like Columbus who brought the pepper to Europe. They became popular and were then brought to North America with the first European colonists. Peppers are tropical plants that are grown as warm season annuals here. Given plenty of sun, peppers are relatively easy to grow. Plant them in well-draining soil with plenty of organic matter. Of course, it depends upon the pepper variety, but most peppers should be spaced about 12-16 inches apart. The harvesting of peppers will vary according to which type of pepper variety you have. 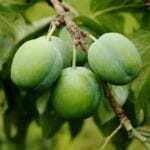 Most sweet varieties mature within 60-90 days, while their muy caliente cousins may take up to 150 days to mature. If starting peppers from seed, add eight to 10 weeks onto the information on the seed packet to account for the time between sowing and transplanting. For most people, this means seed sown peppers will be started indoors in January or February. Pepper harvest time for many hot varieties of peppers, like jalapeños, is often indicated when the fruit is a deep, dark green. Other hot pepper varieties such as Cayenne, Serrano, Anaheim, Tabasco or Celestial, are mature after a color change from green to orange, reddish-brown, or red. Picking hot pepper fruit as it matures encourages the plant to continue to fruit. 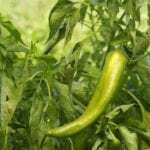 Hot pepper plants should continue to fruit but production wanes into the fall. Sweet pepper, such as bell peppers, are often harvested when the fruit is still green, but full sized. Allowing the bell pepper to remain on the plant and continue to ripen, changing colors from yellow, orange to red before picking pepper fruit, will result in sweeter peppers. Another sweet pepper, the banana pepper, is also harvested when yellow, orange or red. Sweet pimientos are picked when red and around 4 inches long by 2-3 inches wide. Cherry peppers will vary in size as well as flavor and are harvested when orange to dark red. Harvesting sweet pepper varieties requires some finesse, as the delicate branches will break if you tug at them. 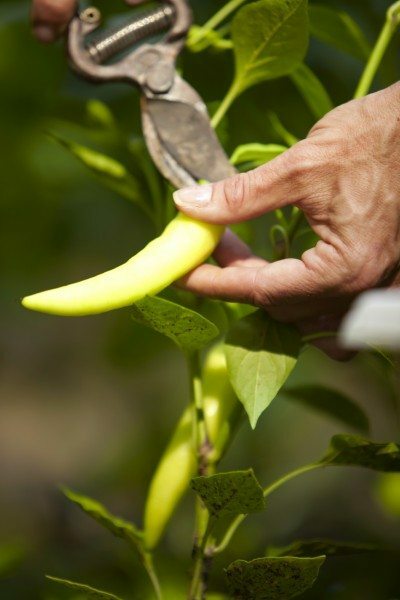 Use hand pruners, scissors or a sharp knife to remove the pepper from the plant. When harvesting hot peppers, use gloves or wash your hands immediately after picking the fruit. Do not touch your eyes or mouth after harvesting or the capsaicin oil, which is probably on your hands, will undoubtedly burn you. Peppers can be stored in the refrigerator for 7-10 days or at 45 degrees F. (7 C.) with an 85-90 percent relative humidity. 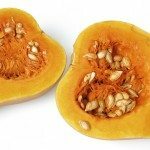 Make them into salsas, add them to soups or salads, roast them, stuff them, dry them or pickle them. You can also wash, cut and freeze peppers for future use. 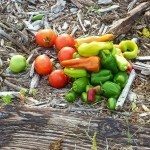 Once the pepper plant has been harvested in most areas, it is finished for the season and the plant will die back during the late fall. In regions with year-round warm temps, however, the pepper may continue to produce, just as it does in the tropical regions of its origin. You can also over winter a pepper plant by bringing it indoors. The key to over wintering is warmth and light. It is possible to keep a pepper for many years in this manner. Many pepper plants are quite ornamental and will continue to fruit indoors and make a lovely addition to the home décor.